The third full length album from Athens, GA-based trio The Whigs is, from the ground up, a work of straightforward lyrics and edgy beats likely to please fans of recent musical trends blending elements of alternative, stadium rock and country. While less derived from punk than previous efforts, the record continues to emphasize a loud, fast, ear-catching sound. The album opens with arguably its best and most interesting track, "Hundred/Million," in which lead singer Parker Gispert quips, “There’s a hundred million people in my mind/which is me and which is not?” The song kicks off strong with a talented effort from drummer Julian Dorio and Gispert's rock-twang delivery. From here the album stays relatively consistent, creating an atmosphere likely to draw in fans of early 90s rock, with heavy guitar and vocals and simple-yet-poetic lyrics. In the Dark makes it clear that the band has shifted its focus to a bigger sound. After a tour with Kings of Leon, the impact of large scale venues has seemingly broadened the Whigs' horizons. With the help of Ben H. Allen, the producer behind Gnarls Barkley’s St. Elsewhere and Animal Collective’s Merriweather Post Pavilion, The Whigs have crafted a sound more suited to fill arenas and entertain music festival crowds. Is this sound the record label wants, or the true sound of The Whigs? That's not entirely clear, as the line between a marketable sound and genuine musical development can be very thin. While In The Dark is overall a quality effort to expand on their underlying style, the band might still have to work out a few kinks in order to reach a broader audience while coming off as completely sincere to their existing fans. 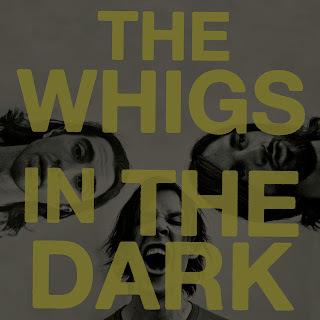 The Whigs will come to Chicago on their tour supporting the record for a show at Bottom Lounge on Friday, April 23 ($15, 8 p.m., 17 and over). Click here for tickets.